Up to 80% of colour maintained after 28 washes. With colour seal-elixir + UVA/UVB filters + concentrated nourishment. Maintains colour intensity. Protects hair. Prolongs colour radiance. Coloured hair.The science of coloured hair Repeated washing, sun exposure, pollution and external aggressions can make coloured hair more sensitive. With time colour fades, losing its shine and intensity. 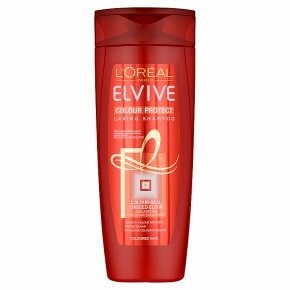 The secret to colour protection The L'Oréal laboratories have created a formula which acts on 3 Dimensions of colour - Intensity, Luminosity, Reflection: 1 Maintains Colour Intensity: The new Colour-Seal Elixir? has been developed to intensively condition, to help protect colour from fading and preserve its intensity. 2 Protects Hair: The formula enriched with UVA/UVB Filters protects coloured hair from external aggressions. Hair looks full of life. 3 Prolongs Radiance: The formula with Concentrated Nourishment intensely nourishes the hair and smoothes its surface. Shine is revived and radiance is prolonged. Proven results Intense, radiant colour: up to 80% of colour radiance maintained after 28 washes* Britain's No. 1 for coloured hair** *Instrumental test after application of shampoo, conditioner and Extraordinary oil for coloured hair. **Shampoo and conditioner unit sales. Directions for Use: Work through the lengths of your hair, right to the tips, and then rinse. Follow with Colour Protect Conditioner, or for even more care and protection, try Colour Protect Masque.